That's why I came here. Thanks for doing the checks for me. I still can't live without my beloved SK, although I've moved some tasks over to EverNote. is there a different program to ope SK98 contact files? One of the beauties of SK98 was that it used standard file formats for everything instead of inventing new ones. The Contacts data can be exported as either a database in .dbf format, a spreadsheet in .CSV or .DIF, or a plain tab-delimited text file. Go to File|Export Cardfile... to start the wizard. I often export to .CSV format when I want to have the data on something like a smart phone which doesn't have a database but does have a spreadsheet. And BTW, we can thank Apple for making it OK to have a device without the ability to have your own data organized in the way you want. The iPhone shipped without a database manager, and now it seems the skill has been lost. My old Psion had a built in database, and there were a number of third party alternatives as well. WHAT YOU WROTE WALEED IS GREAT! However I am nowhere as gifted as you are in the computer land, although I entered into the computing work since personal computers inception. The innovations are too fast, the stranglehold that companies such as Microsoft are imposing on us users are infuriating. I have a clean copy that I use to install on new machines and for testing. It is relatively easy to install - you have to unzip the file, run the setup program, move the patches into the right directory, and set the user permission to Administrator. I have written instructions on how to do all that which I can include in the file. Since I don't own the software, I am asking for a US$50 fee for creating the instructions and packaging everything up. Let me know if you are interested. Hello. This is Edward Berman, and I've been using Sidekick 98 (and prior versions) for decades. I recently upgraded to Windows 10 and was able to get SK98 up and running with no problem (I use it daily at my office in Windows 7 Pro). Then, it would work and not work in Windows 10 and now does not work at all. I uninstalled it this morning, and cannot reinstall it. I have the original SK98 CD-ROM disk. I would not have upgraded to Windows 10 if I knew I would have this problem. I have a lot of SK data saved on my PC and in my external hard-drive. By the way, on 15 August 2015 I attained age 81, still working full-time and plan not to retire. I've been using PCs since before DOS. My first PC had no hard drive, only 5-1/4" 360K floppies. I am "lost" without SK98 at my home PC (where I also work). I will appreciate knowing your solution. Hi Edward. I don't have your 81 years, but my first computer was a Xerox Sigma 9, and we used punch cards. My first PC was an Osborne 1, which had even lower capacity floppies. I am running SK98 on the release version of Windows 10. Did you make sure to right click on the SK98.exe and select "Run as Administrator"? Ever since XP, you have to give permission to old programs that were written before Microsoft added NT permissioning to the OS. I just found this forum. I love reading that other people feel as strongly as I do about SKW. I've also been wondering if SKW 98 (which I prefer to 99) will run on Windows 10, and am glad to read that it's possible. company which now makes Norton Security software. I even think I remember seeing an original version on DOS. Both these apps are invaluable to me. I've used them on 7 to 8 computers; no problems copying the data files. SK 98 was put out by Starfish, which was started by Phillipe Kahn of Borland fame. It was eventually sold to Motorola, which killed it as they did with pretty much anything they touched. This all looks very interesting but I have a different problem that I hope someone can help with. I have the orignal CD ROM disk for SK98. I am trying to install it on a 64 bit windows 10 machine. Each time I try to install I click on the install on the menu that comes up. I get a "please wait" notice but then it freezes. Not sure how to get around this? any suggestions? The first thing to do is copy the contents of the CD to a directory on your hard disk. You should end up with a parent directory of SIDEKICK, with 7 sub directories representing the original floppy disks. Go to DISK1, find SETUP.EXE, right-click on the file and click Run As Administrator. That should do it. Thanks for the quick reply! I did that but it looked like it was starting but then just stopped. When I looked at processes running it showed a 32 bit installer program.However, nothing installed.I even tried to set the properties to be compatible with win xp but that did not work. Any other suggestions would be appreciated. If I cannot get it to run on Win 10 my wife will not let me upgrade her win 8.1 machine. That is curious. Are you running Windows 10 Pro? My understanding is that you have to have the Pro version for legacy software to run. No, just win 10 home. That would be a pain to have to upgrade to pro for this one program! I'm afraid that is the only alternative. Pro versions have better networking support as well, and are not as crippled as Home, so it is worth it. 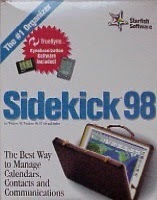 SideKick98 has been an absolutely essential application for me since the days of MS-DOS. Prior to my transition from WinXP to Win7, I was quite willing to pay for an alternative, but my search yield none with equivalent functionality. Luckily, I found it would work with Win7. Now, I’m joyous to learn it will work with Win10. Thanks for passing on that information. Very glad to read this, Windsurfer. SKW is essential for me, too. And I never found a good, versatile substitute either. I actually checked my copy of win 10 and it is the Pro version. However I still cannot get the program to install even if I copy the CD to my hard drive and try from that. Anyone have any suggestions? I am struggling to get SK 98 to run on my just-installed Win10 (Home). My sidekick.exe and yintl.dll files are from 8/14/1997. I cannot find a source for the patches you mention. Nor do I understand why the 2000 dates you mention for the above files. Can you ehlp? Larry, Starfish issued patches for SK98 during its lifetime. Additionally, some fan patched the etwin.dll to add more current time servers than were in the original version. I have the files, but blogger doesn't allow executable downloads. You can private message me if you want. Anyone know if they fixed the Calendar function in Sidekick. Been using its since before Windows when it was a TSR. Hi folks, just saw this blog. I too am an unabashed fan of Sidekick, but didn't know there was a version 98 (have been using the 95 version since almost 1995). I am surprised how come no one has mentioned the program compatibility wizard in all versions of Windows. The procedure is: do not directly install Sidekick but start the program compatibility wizard and then go to the target file which in this case will be install.exe in the Sidekick installation folder (I have been always installing it from my hard disk like some of you). Go through the whole installation procedure and in the end Windows will ask you did the installation work out fine? Say yes, and bingo, you are on your way! @ConcernedParent - I wish it was really that easy. What you will find is that unless you also do the appropriate patching AND remember to tick "Run as Administrator", you will run into trouble. Even with compatibility mode, other programs (such as Outlook) interfere with SK98 unless you load it first. I have been hooked on Vers 1.0. Ever since XPro I have struggled to keep it going by using the knowledge from Tek-Tip and sources like this one. When I loaded on W8 it was the worst but I found ways to work around W8 interfering with loading SK and after each MS update. I got caught in the W10 semi-auto update. Amazingly SK 98 worked but like XPro it was quirky. I finally got it to run compatibility as W98 and administrstor permissions. I still testing the compatibility mode. Most seems to be working except you can't add to the toolbar beyond the SK defaults which is not a big issue for me. I haven't updated to the two patches with the 2000 versions. Curious what would I gain if I updated the two files sidekick.exe and the Yintl.dll? I upgraded from W8 to W10. Sk98 barely worked on W8. I am running SK98 well, so far, by running it as an admin. and in Windows 98 comparability mode. For the first time since before XP, I can customize the toolbar. I didn't have to rei-install SK98. It does seem more stable running SK98 under W98 compatibility. Fingers crossed! I upgraded from Windows 8 to 10 yesterday. Sidekick was in my Win8 Startup, and I was happy to see it open ( if slowly ) at startup. However, if I add data, and close the program, it cannot be re-opened unless I reboot. It simply doesn't react. Makes me nervous! Does anyone know the solution? Why does it open the first time, and what prevents it from opening a second time? I am running SK98 on Windows 10 Pro 64, and it runs flawlessly. I did a clean install rather than upgrade. Unlike Windows 7 where I have to load SK98 before Outlook and have to reboot if I forget, SK98 on Windows 10 runs instantly and cleanly. I would try a clean install as a first trouble shooting step. And make sure you apply the patches, and "Run as Administrator". I have been using SK since it first came out. Currently running SK98 in Windows 7. I ran into something new today. I was adding a Multi-Day Event to the calendar and got the following error"You have reached the maximum number of Multi-Day Event list items allowed". I removed several from the list. Closed the program and then restarted. Alas still got the error message when attempting to add a new multi-day event. Any suggestions on how to resolve the issue would be greatly appreciated. Waleedf: you mentioned you have clean copies of SK98 for $50? I've posted here before, having used Sidekick for years, currently with Windows 7 Pro. Until a few hours ago, it was working fine. Had another computer issue, and some changes were made. But SKW still ran. Then I tried to see which startup app might be causing the problem, and began removing them (in msconfig startup) 2 or 3 at a time. All the files I remove3d are all back. But even after several reboots, SKW won't run! It starts, then instantly stops. After several more tries, I removed it with Windows add/remove. Then I went to the Install files..... and SKW Setup won't launch! I've tried each with and without Run as Administrator. I tried each with compatability for Win XP as well as Win 7. It won't run! Could some utility needed for 32 bit software be missing? I hope someone is reading this and can HELP, PLEASE! Kami! Have you considered using SFC.exe ( system file checker) to determine if your OS is not corrupted. My SK98 runs great under W10 compatibility mode for W98. I don't understand why it SK can't be bought and re-issued. I would pay for that to happen. I was able to get SKW98 re-installed by restarting the computer after removing all the items from the msconfig Startup list. Without adding back files into that list, SKW98 is working (so far). I added back only a couple of the items, and a couple of other apps added a couple more back in. So far, so good. JJM, I'll try that, thanks. I'm a lifelong SK98 user and have struggled through various Win versions, trying to get it to launch, etc., and eventually it works. But "something happened" yesterday such that the calendar file is empty. SK runs (admin, etc.) and comes up on the proper day but empty. I have business plans from the past and into the future - critical to get them back. I have the file backed up several places - that's not the problem. It runs but the entries are empty on a file that's 4kB in size! There's a bit somewhere that got changed, probably but I'm very careful not to fool around with SK files. Any clues? I'd really appreciate something that gets my calendar content back, and soon ----- Thanks. Don D have you open the right calendar files? SK98 may have loaded a default file not your file. Are you using W10 compatibility mode? SK98 runs near perfectly for me under W10 compatible mode W98. Just my thoughts with the info you have given. JJM - thanks for your reply. I'm running SK in Win 10 under Win XP compatibility, and I'm an administrator. I'm sure I opened the right "EVEN" file because I know what folder the SK files are in; and this one I keep an eye on because its size - a little over 4MB fits the decade of calendar entries. The top line on the calendar screen that shows what file is open is correct, and the file it accessed had the 4MB size in File Explorer, but no entries showed on the screen. Zero. Blank. I then retrieved (from several places that I back up) the nearest dated EVEN file, opened it, and found the entire history I needed but up to only Dec 6. So I'm missing all the holiday work and events I recorded for about a month plus all my plans for 2017. However, my cellphone calendar had a lot of it, and I got more from dated invoices. My address files were gone as well, and I've restored them from a backup, with some unknown amount of entry loss. But mostly phone numbers, and I can recover from that. I'm not totally unhappy, but now I'm concerned that some backup program I give access to the SK files may have corrupted this one - that is, wiped the EVEN file clean of entries. And, as I forgot to stop the backup, my empty file has probably replaced whatever good ones there were. But not everywhere, and I did recover one that worked. I'm satisfied that SK is working OK but the file system somehow lost the data. Question 1 - I don't have the "To-Do" list, that was full of items. It wasn't recovered with the EVEN file. Do you know if that is in a file separate from the calendar file, and if so what is its name and how do I open it, either in SK properly, or in a text editor where I could copy-paste the list into the current blank SK calendar To-Do space? I know the data is carried-forward for 30 days or so, and there's nothing in the new one to carry forward. But I've started entries into the blank file - a few a day - and I see that they're being scooped up each day into a new list - so it's working. Question 2 - At one time - I've forgotten where or how - there was a screen that let me set advanced preferences such as 30-day carry-forward of the To-Do items. Do you know where that screen can be accessed? I think SK is working pretty well at the moment but I'm not through trying to get fully recovered. Thanks for any help you might have. I am currently using: SideKick ver. 2.00p from Starfish Software. Running it on Windows XP mode - Windows Virtual PC; Windows 7 Professional, Service Pack 1, 64 bit. I may need to upgrade to a newer computer soon, as this one is acting up. I would like to still use SideKick on the new computer (Windows10 - any specific version suggested?). What steps would you all suggest I take to enable me to use SidKick on the new computer, as I have not been able to find anything as good, or how to transfer the SideKick info to another program. Mainly I use the Calendar portion of Sidekick. SK98 installs cleanly on Windows 10 Pro 64 bit, and people have also reported success on Windows 10 Home. The key is to use XPSP3 compatibility mode, run as Administrator, and apply the patches. I think we have all been looking for alternatives without success. The whole category of independent Personal Productivity Programs has been pretty much wiped out by Microsoft Office. I use Outlook for mail, but it is a pig for Contacts which I keep in SK98. Delighted to see these posts as I was also a user of SK98 until I upgraded to Win10 Pro 64 and couldn't get it load. At that point, most Bummed. I've tried your suggestions, running as admin, with all the disks separately copied to my W10Pro64 computer hard drive. The problem I'm encountering is that the install wizard says it can't find a certain file (that it doesn't identify) when it gets to Disk2. Now, my Disk2 seems to contain but one file: "DATA2.CAB". So if there are other files that should be on Disk2, then mine is faulty. But if that is all there is on Disk2, what gives? My DATA2.CAB file is 8/21/1997 vintage and 1414KB in size. All of the disk directories after DISK1 contain single files ending in .CAB. The setup.exe program reads these files and decompresses them into the original separate files. Remember, when SK98 was released, Starfish was committed to keeping the program size down to run off floppies, and to avoid any entries in the Windows registry. Looking around the web, there is an article at https://www.lifewire.com/cab-file-4144227 that explains CAB files and how to look at them. There is a free program on Github that can look inside CAB files, but it is only in source code form, so you need to be able to compile it to run. Are you sure you are running SETUP.EXE with administrator privileges? Roght-click and "run as administrator". Thanks for the response, Waleed. So I tried it again, and this time it took Disk2, but then balked at Disk3, giving the same error message that it couldn't find the file. Sorry Nick, I have no other idea as to what is happening with your install. I have never seen or read about this behaviour before. Waleed, I think I got it! Thank you! This morning I tried setting up a new directory from which to install the program and unzipped the 7 Sidekick files I had into that new directory. Then ran as administrator the sidekick setup.exe file in Disk1 and it seems to have installed Sidekick98! Now, do you recommend having the program automatically set up email, or should I do a custom install, or ...? Hi Nick, great to hear that you were able to install. I don't include the email or TrueSync simply because things have moved on so much since they were written. I prefer to keep the install as small and clean as possible to avoid bumping into more modern programs. You can just do the install again, and it will overwrite the first one. Remember to apply the three patches as well.